You may not recognize the people in this picture, but they are in fact NGAP Director David Wolf, Jon Wolf; his son, and I.M. Original. I.M. Original happens to be the racing name of one of the first 5 greyhounds that we had ever brought up for adoption. 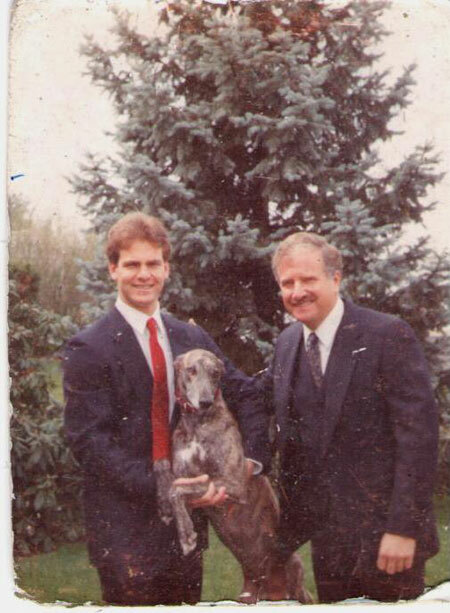 In January of 1990, we had not intended to adopt I.M. Original, but when he went to his first family, he somehow had gotten an ear infection and his ears were badly inflamed. Being an alpha male, I.M. Original got very angry if you got close to him. He was subsequently returned and never left and lived out his life in the Director’s house. He was the only greyhound in my home that could ever catch a ball in the air on a bounce, catch a ball thrown 50 feet away, and even catch a Frisbee in flight. No, we never forget those greyhounds from long ago.